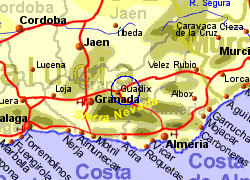 Located on a plateau 900m above sea level in the north eastern foothills of the Sierra Nevada, 50Km east of Granada city, the small city of Guadix is well known for the large number of cave houses in and around the town, infact, part of the city, known as the Barrio Troglodyte, is entirely underground. There is also a cave museum. The area is mostly agricultural but pottery is also important to the local economy - you will see pottery for sale on the side of the road. 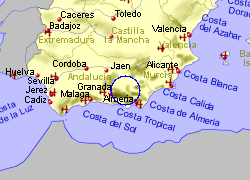 A Moorish castle sits on slightly higher land near the centre of the town, not far from the 16th century cathedral which was built on the site of a Moorish mosque, in a Gothic style with a Baroque facade. 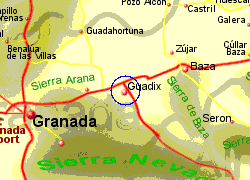 Map of the Guadix area.